A team of astronomers from Maryland, Hawaii, Israel, and France has produced the most detailed map ever of the orbits of galaxies in our extended local neighborhood, showing the past motions of almost 1400 galaxies within 100 million light years of the Milky Way. The team reconstructed the galaxies' motions from 13 billion years in the past to the present day. 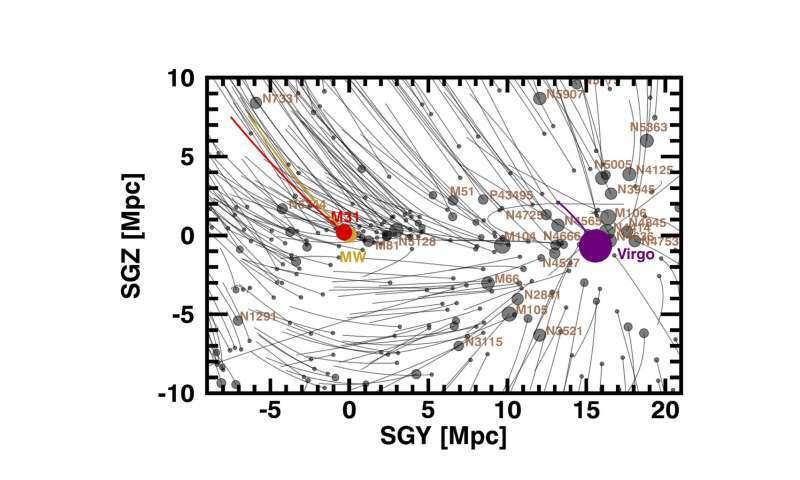 The main gravitational attractor in the mapped area is the Virgo Cluster, with 600 trillion times the mass of the Sun, 50 million light years from us. Over a thousand galaxies have already fallen into the Virgo Cluster, while in the future all galaxies that are currently within 40 million light years of the cluster will be captured. Our Milky Way galaxy lies just outside this capture zone. However the Milky Way and Andromeda galaxies, each with 2 trillion times the mass of the Sun, are destined to collide and merge in 5 billion years. "For the first time, we are not only visualizing the detailed structure of our Local Supercluster of galaxies but we are seeing how the structure developed over the history of the universe. An analogy is the study of the current geography of the Earth from the movement of plate tectonics," said co-author Brent Tully, from the University of Hawaii Institute for Astronomy. These dramatic merger events are only part of a larger show. There are two overarching flow patterns within this volume of the universe. All galaxies in one hemisphere of the region - including our own Milky Way - are streaming toward a single flat sheet. In addition, essentially every galaxy over the whole volume is flowing, as a leaf would in a river, toward gravitational attractors at far greater distances. Representations of the orbits can be seen in a video (below) and, alternatively, with an interactive model (below). With the interactive model, a viewer can pan, zoom, rotate, and pause/activate the time evolution of movement along orbits. The orbits are shown in a reference frame that removes the overall expansion of the universe. What we are seeing are the deviations from cosmic expansion caused by the interactions of local sources of gravity. The study, Action Dynamics of the Local Supercluster is published in the December 4 issue of The Astrophysical Journal. This is great stuff! This article clarifies some of the unknowns and the confusing bites of data for me. Helps me improve the accuracy of the suppositions of my cosmic viewpoint over the next few billion years.